Hours? Doubtful. Aly is only little, and a comprehensive Waleed strip-search should take only a few minutes. And if it “went for hours” he’d have likely missed his flight. He had to undo his jeans. Why, the sheer indignity. It’s almost as bad as a routine medical examination. Or using an airport men’s room. Yes, you do. It’s because Israel is under attack from Waleed’s co-religionists and must therefore take extreme security precautions. No, it isn’t. It’s airport security checking you out. Not complicated. Yes, you do. It’s going to the point where security finds nothing and sends you on your way. Think of it as a mere irritant, Waleed. You know, just like the nice Islamic terrorism that as you say “kills relatively few people and is not any kind of existential threat”. For the record, I was strip-searched when entering Israel in 2007. No big deal. I was directed into a room, asked to remove all outer clothing, had a few swabs runs over my skin, answered a bunch of questions and that was it. The whole process took maybe 15 minutes. Considering Israel’s terror-threat situation, this was no problem at all. I’ve also been given the private-room strip-search treatment at a few other airports. In Paris I requested it but was declined. Those French chicks are picky. The tiniest little thing can upset people these days. A little thing like, say, mocking their holy super lord wisdom emperor. Waleed Aly’s fans are a devoted bunch, exceptionally so, and they don’t much like it when their leader is questioned. Even when Aly is gently called to account for saying something ridiculous, which from time to time he is prone to do. For example, back in 2013 Ten’s The Project co-host offered a few theories about the Boston Marathon bombing. Aly then repeated inaccurate predictions that Boston’s Islamic terrorist bombers might turn out to be “self-styled American patriots”, but that’s neither here nor there. Just keep in mind his dismissal of terrorism as a mere “irritant” while you consider Aly’s furious description last week of an atrocity so appalling that Aly has never been more “shaken or angry”. Following an interview on The Project with some dippy local left-wing activist who claimed she’d been strip-searched, Aly volunteered his own terrifying tale of semi-naked humiliation. It went for hours? Really? (By the way, Aly’s line about “trying to leave Israel” is adorable. It isn’t as though negotiating Ben Gurion Airport is like scaling Everest’s treacherous north face.) So how was Aly occupied during his “hours” of captivity? 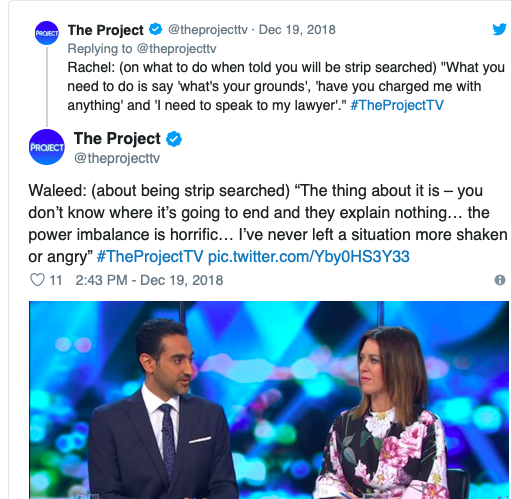 At this point Aly’s co-hosts Peter Helliar and Gorgi Coghlan, who apparently have never heard of anyone being searched at an airport, much less sainted Waleed, wore expressions of such profound concern you’d have sworn they were listening to an inoperable cancer diagnosis. “You’re just in this situation, you don’t know why,” Aly continued. Actually, he does. Israel is under frequent attack from Waleed’s co-religionists and must therefore take understandable security precautions. Any reasonable person would know this. “The power imbalance is horrific,” Aly next observed, apparently demanding equal authority to an Israeli airport security guard working in an Israeli airport. Don’t they know who he is? Attacks on the London rail system. The murder in Melbourne of Sisto Malaspina. Repeated deadly onslaughts in France and Germany. The Boston bombings, committed by Muslim immigrants to the US who killed three and savagely injured hundreds. Islamic State torture killings in Syria and Iraq. Suicide bombings and bomb attacks throughout the Middle East, particularly in Israel. Beheadings just last week in Morocco of Scandinavian tourists Louisa Vesterager Jespersen and Maren Ueland, whose deaths were filmed and posted online. These are “irritants” in Aly’s world. What really gets him shaken and angry is being pantsed in an airport. The lad has interesting priorities. As it happens, I’ve also undergone a strip search at the very same airport. Arriving in Israel for the first time in 2007, I was directed by security to a small room, invited to disrobe and asked numerous questions. All very routine. I’ve copped similar treatment at a few other airports. The most annoying part of the entire Ben Gurion procedure was forgetting my belt, such was my haste to leave and begin exploring Tel Aviv. On the “shaken and angry” scale, being dakked by bored but polite security personnel was about equal to being given a small serve of fries when I’d asked for large. Anyway, I mentioned some of this last week at my News Corp blog. The reaction from Aly’s Twitter admirers was wonderful. “Someone called Tim Blair is writing garbage about a decent and responsible person in Waleed,” one chap wept. “Tim Blair should not be given a platform in the media. Only Murdoch would print this disgusting piece. We need a decent Media Standards Watchdog in Oz, with very sharp teeth. Much of Murdoch’s media output wouldn’t pass muster. A not I may be, but at least Jackie from the Gold Coast spelled both of my names correctly. Stand by for another “shaken and angry” tirade from “Wahleed Ali”, whoever the hell he is.